Lee Ashcroft’s players are seven points clear of Avro at the top of the table, having played two games more. Town are back in action on Saturday when they travel to AFC Liverpool, while Avro do not play again until next Wednesday after a run of cup fixtures leaves them with matches in hand. That next league game sees them travel to Garstang, who have a big part to play in the title race given they host Longridge on Easter Monday, April 22. 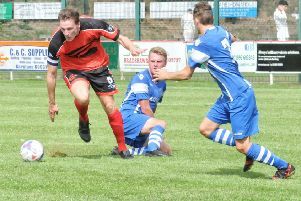 Baker’s players have enjoyed a run of success aginst Town in recent times, having won the last five meetings between the two sides. This season brought a league win on Boxing Day, following on from a penalty shootout victory in the Division One Cup. Baker said: “I don’t know what it is about us and Longridge. “We have had some good results against them in the last couple of years. “Ashy has the best side in the division that we will have faced this season; he has a very high standard of player at his disposal. “Myself and Ashy are all right and I’d rather Longridge win the league; they play good football and they have scored the most goals. “I hope there’s a nice crowd for the Easter fixture and that it’s a good game to watch.